Hello! How was the past week for you? Mine started out well but we hit a few bumps as the days wore on which made it a bit icky and tiring. 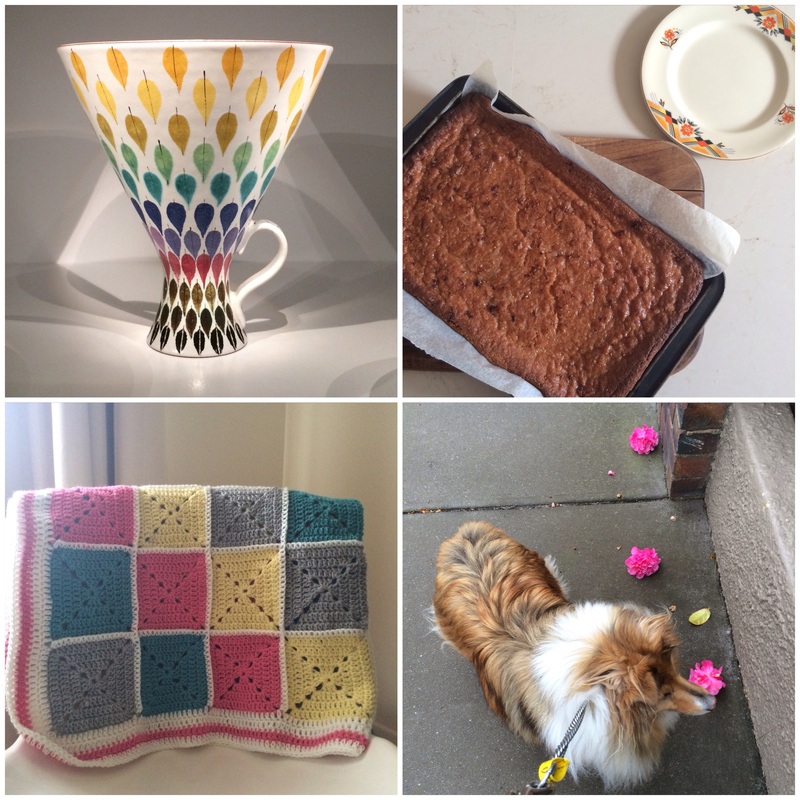 Today I’m joining in with Isabel of Nanjing Nian and sharing four photos of my week. This was an idea started by the Queen of Ideas Pip Lincolne but Isabel has taken up the reins and is inspiring us to share our weekly happenings. Thanks Isabel! As I was putting together images from my week, it struck me how much my online friends have become a part of my real life. So let’s explore that a little, shall we? Last Sunday I jumped on the tram and travelled in to the NGV for a lovely catch up with some Blog with Pip ladies and the lovely Pip herself! Such fun! Some people I had met before in real life but others were still only names in my Facebook feed so it was excellent to be able to put faces to names. Coffee and tea was consumed, paintings, drawings and decorative arts explored and explained. The conversation may have been a little loud and we may have been told to shoosh! Oops! Crafty gals create uproar at the gallery! As I wandered through the rooms with Emily of Squiggle and Swirl and Dawn of Kangaroo Spotting, I spied this beautiful Spectrum Leaf vase from the Nordic Cool: Modernist Design exhibition. Isn’t it just gorgeous? We ‘oohed and ached’ over the simplicity of its form and the beautiful rainbow colours of its leaf design. I spent the following days re-reading and searching out the blogs of those I’d met and enjoyed sharing in their projects, the books they were reading and their thoughts on life. Pip shared this recipe for tangy, chewy lemon squares. I thought they looked perfect for testing out my new oven. The oven worked well and we managed to create, between us, lovely chewy, citrussy, syrupy morsels. I noticed the boy come back for an extra piece quite quickly! After eating my sticky squares, and rinsing off my sticky fingers, it was time to grab the wool and finish my solid granny square blanket. I wrote about that here. Thank you to Bec for giving me inspiration to make this blanket! And so, you see? My online world is enriching my real life world! So happy! I would never have had the opportunity to connect with these lovely peeps without the internets! But there is still just the real, face-to-face, everyday world. And taking one of the doggies for a walk is part of that. There are lots of camellias flowering around our streets at the moment and their fallen petals are scattering the footpath. Sometimes you find a full bloom laying at your feet. On Thursday I saw three lined up in a row and I thought they’d make a pretty pic of the gorgeousness we can experience in the ordinary events of the day. Are you good at keeping your eyes open for the loveliness in the every day? I’m TRYING to keep my eyes more open because I can tend to become a little consumed by what’s just happening in my head! Perhaps that’s like you too? One week, four pics. A cute little reminder of what I’ve seen and done. What were the highlights of your week? < Previous Here’s something I made! Yes, she is a sheltie/ mini Collie. We have another one, too, but he is older (14) so doesn’t get out for long walks anymore. Haven’t tried the link yet but crossing my fingers for success! Looks like you had success…thumbs up! It was lovely. Very lucky that she’s a Melbourne girl! I liked the BWP course. I still glaze over about the techy stuff a bit but it’s good for writing tips and, like all Pip’s courses, the community it creates. I’ve loved the conversations it’s opened for me both at home and around the world – just like this one!